Clarkesworld Magazine occasionally has need of new slush readers. If you are interested, please fill out this application. We never know when an opening will happen, but when one does, people on this list get priority. This is an unpaid volunteer position. Slush readers & other staff are prohibited from submitting stories or articles to the magazine. You will be expected to read and provide comments on an average of five stories per day. Another thirty day snapshop of the slushpile for Clarkesworld Magazine. This time, I was asked to break it down a bit more and include the number of stories that were “passed up” or recommended by our slush readers. Since someone asked… here’s another Clarkesworld slush pile data junkie post. Genre classification is provided by the authors at time of submission. I don’t always agree with these. For example, I would categorize most of the OTHER classification as fantasy. Gender classification is determined by how the author chooses to represent themselves online. After several months of health-related distractions, it was a real pleasure to spend the weekend in Toronto while attending the World Fantasy Convention. I have to give a big thanks to Lisa for letting me go and to Kate Baker for driving us (Genevieve Valentine and I) up there. It wouldn’t have been possible any other way. The drive up and back was much longer than I ever like to be in a car, but time just flew. It’s rare for me to be anywhere with people that share common interests and musical tastes, so it worked out wonderfully. Along the way, we saw a tornado made of birds and Niagra Falls (Canadian side). The Con itself was also great. My panel on ebooks was on Friday, so I was able to enjoy a mostly obligation free weekend the rest of the time. Sean offered some space for the Clarkesworld chapbooks on his table in the Dealer’s room, so I hung out there a lot and spoke with a lot of people. Among the Clarkesworld authors I ran into there were E. Lily Yu, Suzanne Church, Mari Ness, Cat Rambo, Holly Phillips, Lavie Tidhar, Tony Pi, Brenda Cooper, Aliette de Bodard, Mary Robinette Kowal, and (of course) Genevieve Valentine. The chapbooks attracted some nice attention and sold well. If I could have fit more in my bag, those probably would have sold too. Several people asked me about print subscriptions, but the cost of mailing creates some pricing concerns. One of the things we may do is offer a subscription plan that bundles issues together in quarterly bundles. I’ll start making copies and bundles available for sale on the website once we get power back at the house. As you know, Kate, Cheryl, Sean and I were up for a World Fantasy Award this past weekend. We were hoping that the third time would be the charm, but it wasn’t to be. We lost to Tartarus Press (who claimed their third win). I have to admit to being somewhat disappointed, even though I never expected to win. (Heck, I never expect to be nominated. This is still a very surreal experience for me.) Thanks to the judges and voters for thinking us worthy of being nominated! Due to extreme weather conditions, it is unlikely that we’ll be maintaining Clarkesworld’s normal 24-48 hour response times this week. Hopefully when this clears, I’ll still be able to get to Toronto for World Fantasy Convention. Supposedly, I’ll have power and internet there, so at worst, I’ll catch up then. There was a discussion on Twitter today about UK authors submitting stories to US markets. Since my data for Clarkesworld was referenced, I offered to dig a bit deeper into the stats for some more relevant data beyond overall percentages. 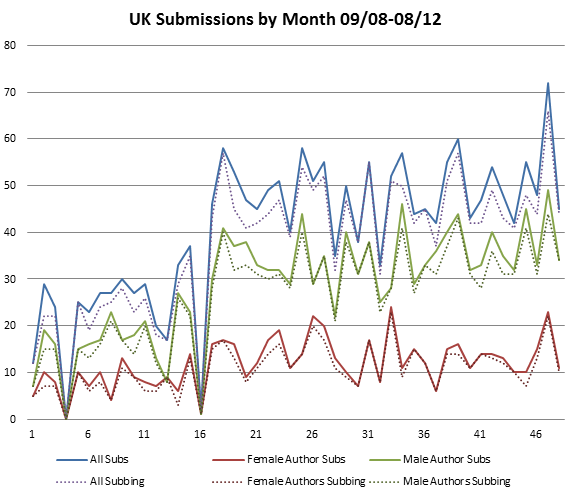 Here is a breakdown of all UK submissions (and authors) per month and by gender from 09/2008 through 08/2012. During this time period there were 1366 UK submissions from men and 569 from women representing 730 men and 262 women. We have seen submissions from 992 different authors from the UK. The dashed lines indicate the number of authors that turned in the submissions in the solid line. Most authors only submit one story per month. The two low points on the above graph indicate periods that we were closed to submissions. The overall percentage of stories we receive from the UK fluctuates between 6 and 8% of our total submissions on the average. The overall percentage of UK authors submitting stories is roughly the same, until the last year, women had a slightly higher percentage than men when compared to all authors from other countries submitting to the magazine. Now they are nearly equal. A few of my earlier data posts can be found in a CW editorial (06/12), here (02/12), and here (12/09).